We worked closely with Ibicus to develop their company logo and freshen up their brand. It was important that the new logo could be applied across all media (print and on-line), and also that it could work equally well in full and single colour. 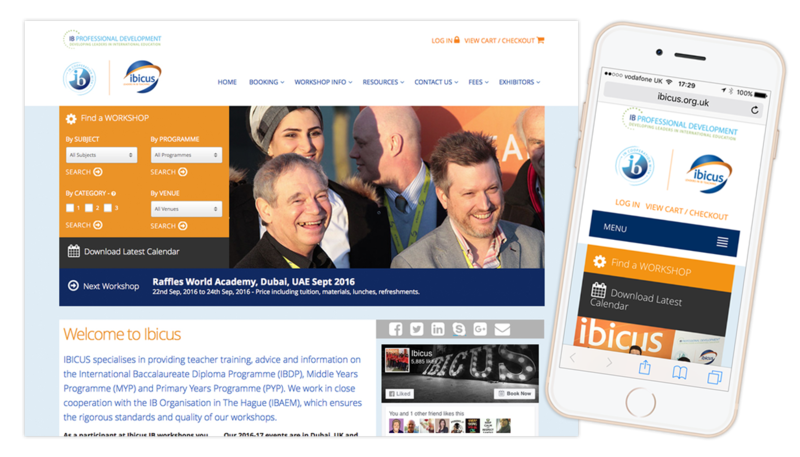 The Ibicus website encompasses a complex range of information and utilities, and our objective was to make the website more user-friendly for both the visitor and the administrator. The first challenge was to design a home page and navigation system that established a hierachy of information. This would ensure that a new visitor to the website would immediately be aware of the scope and extent of information available. The website includes a shopping basket, search facility and Facebook feed. In addition there is a separate log-in for workshop leaders to update their own biographies and download useful documents. Web analytics has also been integrated to provide detailed tracking of website usage. In the multi-device world we live in, Ibicus’s new website embraces the latest programming techniques allowing the website to adapt to different screen sizes. The website was re-developed and programmed in PHP as the base platform. This was a fundamental choice for creating a powerful content management and eCommerce system. Our bespoke content management system enables the administrator complete flexibility to edit any part of the website through a password protected portal. Furthermore, a fully managed eCommerce system ensures secure payments and accounting records. Invoices and statements are automatically generated and can be managed by Ibicus. Our pop up displays not only provide you with a large display area for maximum exposure but, they also work perfectly as event backdrops. Whether you want to remain traditional and opt for a pop up that uses graphic panels or you choose to purchase a contemporary fabric display, you can be sure that your message will be communicated effectively.